If plaque is desired on the stand please enter your inscription in the box when placing your order. Painted Noah's Ark Yemenite shofar is made from the horns of kudu antelope. Painted on the shofar is a lion, Noah's Ark in the water and the Dove of Peace. On the other side wrapping around is an Olive Branch. The shofar can be used for Holidays or any time. Made in Israel! Great gift for Bar Mitzvah, holidays, or special birthday! Comes with large Acrylic Shofar Stand. Measures approximately 40". 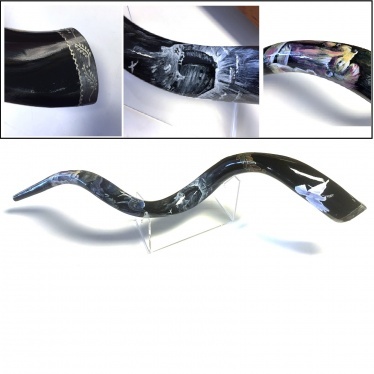 The Painted Yemenite Triple Twist Large shofar comes from Israel and is specially packed. These have a polished finish. All shofars are made in Israel and certified kosher. Since shofars are a natural product, no two shofars are exactly alike. Expect variations in the coloring and exact size and shape of the shofar you receive. PLEASE NOTE THAT SHOFARS ARE MEASURED ALONG THE OUTSIDE EDGE OF THE CURVE. If you want an acrylic stand with a customized silver/black plaque affixed to it that is available, too. You can have your name in English or Hebrew. Enter it in the text box at checkout. If you would like a higher resolution picture email/call and we will send to you, info@jewishbride.com.